Participants of the G20 Summit pose in Baden-Baden, Germany. Baden-Baden: After threatening environmental financing with the axe, US President Donald Trump's administration on Saturday defied the international community by refusing to renew a pledge on combating climate change. 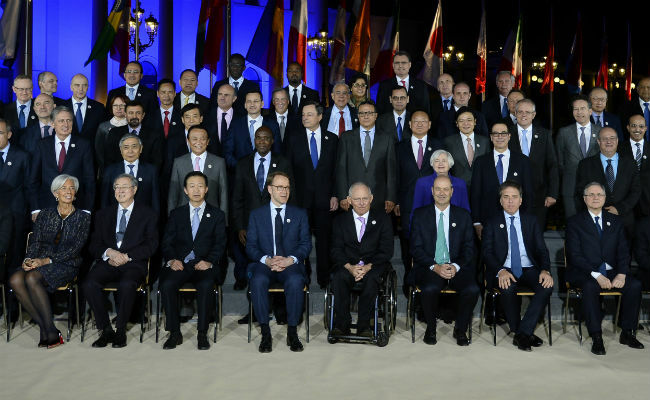 Finance ministers from the G20 top economies meeting in the western spa town of Baden-Baden were forced to leave out an entire section related to the Paris accord on combating climate change, after Treasury Secretary Steven Mnuchin said green issues were "not in my track". Environmental activists condemned the decision, slamming the world's biggest economy for "keeping ambitions down". Mr Trump, who once claimed that climate change is a Chinese hoax, has said he will roll back American environmental regulations aimed at curbing the problem and has threatened to pull the US out of the Paris accord on combating climate change. In his first national budget on Thursday he proposed a drastic cut in environmental financing, including slashing funds for the Environmental Protection Agency by a third, as well as eliminating contributions linked to UN climate change programmes. In the southwestern spa town of Baden-Baden, negotiators drafting a final statement had sought to renew a pledge at last year's G20 summit in Hangzhou, China, to provide "strong and effective support and actions to climate change". The 2016 meeting also saw finance ministers explicitly welcome efforts to bring the Paris agreement into force. Further, developed nations had pledged to provide "financial resources to assist developing countries with respect to both mitigation and adaptation actions in line with Paris outcomes." But in Baden-Baden, that entire section was ditched. "President Trump is looking at the Paris treaty and other treaties and the administration will have views on that as they consider their policies," said Mr Mnuchin, adding that was "more of an issue for G20 leaders and less of an issue for finance ministers." John Kirton at the G20 Research Group said it was not surprising that the Trump administration would resist signing up to such pledges as it would give the Paris agreement legitimacy - something that goes against Trump's campaign vow to pull the US out of the deal. Action Aid's policy manager on climate change, Harjeet Singh, said that such action was "very discouraging for the climate movement." "Poor people in developing countries are struggling already with the impact of climate change," he said, pointing to the serious drought plaguing the Horn of Africa. "A country like the United States has a historical responsibility, and should be a champion in leading efforts towards combating climate change. "But instead of doing that, they are keeping ambitions down and leading others to regress," he told AFP. Climate Action Network International's Europe director Wendel Trio said Washington's reticence over the Paris agreement would not actually destroy the accord, given that the deal has already been done. But it would have a "symbolic impact," he told AFP. "The fact that the US is signalling less ambitions allows other laggards like Saudi Arabia or Iran to hide behind it," he warned. Li Shuo, senior climate policy advisor at Greenpeace East Asia, said: "The lack of attention to climate in the G20 finance statement is no doubt due to the Trump administration's irresponsible and isolated approach to climate change." "Other countries should not allow this to happen again," added Li.